It's that time of the year again... baseball season. Are you a fan? 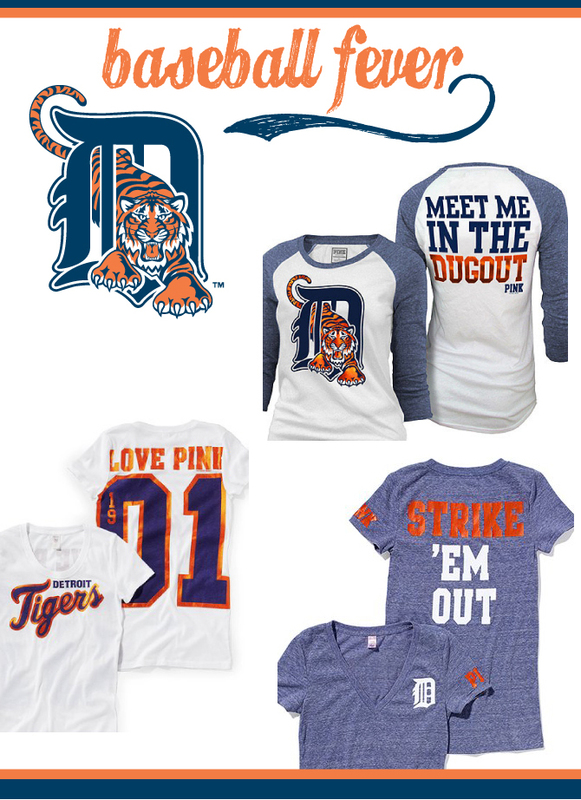 I absolutely love baseball, being from Michigan I am definitely a Detroit Tigers fan! While in Victoria Secret I noticed that their Major League Baseball Pink collection has expanded, and gotten cuter. Pink Big League Love. ps, random fact: today is 4'11 and that's how tall I am. I don't have one but my hubby is obsessed with the CUBS! it is cubs all the way every year. So this year I am hoping they do good so he can be satisfied. I don't think he will ever be satisfied until they win the whole thing! yes indeed! Love baseball too! Gotta go with the Cleve indians...high hopes for them this season and so far, they are delivering! I bought a VS Huskies hoodie when my Uncle taught at the University of Washington and I LOVE it... I guess I could do with a few baseball tees :-) Although I REALLY want them to come out with hockey tees! I dig on the Padres, and I am 6ft tall. Cleveland Indians are my team (of course, I'm from Ohio). VS baseball line is way too cute. I have been to many baseball games, but I prefer to watch from home. Don't have to fight the fans that way. RED SOX!!!! <3 I can't help it! Loving the pink baseball goodies! so flipping cute! I was born, raised and still live in Boston but I am a football gal and hockey gal. Baseball is just so slow! I am almost a foot taller then you, which is totally weird! i love going to baseball games in the summer! my favorite team is probably the atlanta braves! Not a baseball fan but I enjoy going to the games. I not a "fan" either, but do enjoy attending the games. My only rule is that I get a hot dog and beer! Their college/nfl stuff is adorable too! Have a great day! For sure loves the AZ Diamondbacks, Cleveland Indians, and Atlanta Braves! Can't get enough baseball!!! I'm not a big baseball fan, but I love the VS baseball line! I saw this line and it is just adorable. LV doesn't have a pro time and I don't follow any team in particular. I wish I did cause I would totally pick up one of these tees. Too cute! Awe you're petite I loves that too! I love the Orioles. I can't handle watching them on the tv though. Very cute! I must check it out. I am a Rays fan (even though they stink this year)...gotta represent TB. We were both born in the Bronx so it's all about the Yankees though I grew up close to the stadium for the Mets!